After 20th Century Fox's Logan came away with an easy box office win last weekend, many were expecting the superhero movie to take the top spot at the box office this weekend as well. While Logan didn't suffer a tremendously drastic second weekend drop (57.2%), it did drop to second place, with Warner Bros. Kong: Skull Island overperforming, taking in an impressive $61 million while Logan earned a decent $37.8 million. While it was originally expected to be a close weekend at the box office, Kong: Skull Island had no trouble running away with the box office crown. Box Office Mojo reports that Kong: Skull Island opened with an impressive $15,865 per-screen average from 3,846 theaters. While the debut was impressive, it does fall quite short of 2014's Godzilla, which opened huge with $93.1 million in 2014, but dropped a massive 66.8% in its second weekend and 61.2% in its third weekend, closing its domestic run with $200.6 million with a worldwide tally of $529 million, from a $160 million budget. 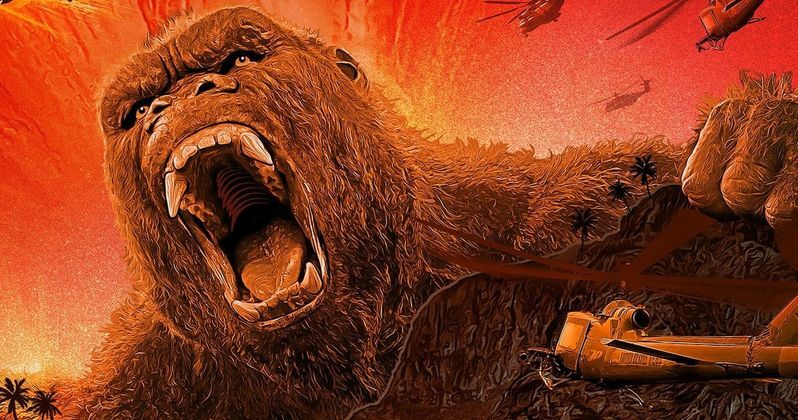 We reported last week that the Kong: Skull Island post-credit scene will tie into the upcoming Godzilla: King of Monsters, arriving in 2019, which will then tie into Godzilla vs. Kong, debuting in 2020. While Kong: Skull Island may not have a bigger debut than Godzilla, it may have more longevity at the box office and have a better overall run at the box office, but we'll have to wait and see. The critically-acclaimed Logan also had a strong overseas debut, with $159 million, for a global total of $247.4 million. The story is set in the year 2024, where the mutant population has shrunk significantly and the X-Men have disbanded. Logan, whose power to self-heal is dwindling, has surrendered himself to alcohol and now earns a living as a chauffeur. He takes care of the ailing old Professor X whom he keeps hidden away. One day, a female stranger asks Logan to drive a girl named Laura to the Canadian border. At first he refuses, but the Professor has been waiting for a long time for her to appear. Laura possesses an extraordinary fighting prowess and is in many ways like Wolverine. She is pursued by sinister figures working for a powerful corporation; this is because her DNA contains the secret that connects her to Logan. A relentless pursuit begins ... In this third cinematic outing featuring the Marvel comic book character Wolverine we see the superheroes beset by everyday problems. They are aging, ailing and struggling to survive financially. A decrepit Logan is forced to ask himself if he can or even wants to put his remaining powers to good use. It would appear that in the near-future, the times in which they were able put the world to rights with razor sharp claws and telepathic powers are now over. The top 5 will be rounded out by the horror hit Get Out dropping to third place with $21 million, followed by The Shack in fourth place with $10.5 million and The LEGO Batman Movie in fifth place with $7.8 million The top 10 will be rounded out by Before I Fall ($3.1 million), Hidden Figures ($2.76 million), John Wick: Chapter 2 ($2.7 million), La La Land ($1.7 million) and Fifty Shades Darker $1.6 million. Also opening in limited release this weekend is IFC's thriller Personal Shopper which earned $92,516 from four theaters for a $23,129 per-screen average, FIP's romantic comedy Badrinath Ki Dulhania, which earned $850,000 from 152 theaters for a $5,592 per-screen average, Paladin's drama The Ottoman Lieutenant, which earned $173,450 from 216 theaters for a $803 per-screen average, CBS Films' drama The Sense of an Ending, which earned $42,000 from 4 theaters for a $10,500 per-screen average, Focus World's horror film Raw, which earned $25,230 from 2 theaters for a $12,615 per-screen average, and Parade Deck Films' The Dark Below, which earned $1,477 from one theater. No box office data was given for Brainstorm Media's dram The Other Half and Strand's foreign drama Suntan. It remains to be seen if any of these films will expand into a wide release in the weeks and months ahead. Looking ahead to next weekend, Disney brings its highly-anticipated Beauty and the Beast live-action adaptation to the big screen, going up against the R-rated thriller The Belko Experiment. Also opening in limited release is the long-awaited sequel T2: Trainspotting, which will have expansions on March 24 and March 31 respectively, Well Go USA's thriller Bluebeard and Freestyle Releasing's Burn Your Maps. Take a look at the box office estimates for the weekend of March 10, and check back Sunday for the box office estimates, and on next Tuesday for our next wave of predictions.